A MOUNT as in MOUNTAIN in FLORIDA?! Well, by Florida standards, I guess 184 feet above sea level qualifies! LOL! I just love the history of places, and this little city is full of charm and interest – and ANTIQUE MALLS! My only problem is that I don’t think there is enough wiggle room for me to see any of them because our day yesterday was filled with just GETTING HERE (by 9am!) after leaving Daytona about 7:30am. Will we make it in time? Somewhere in the forest region (Where I even saw “Watch for BEAR” signs!) we lost GPS signal…. Quipped by Bonnie K. Hunter at 7:42 AM 13 Snips & Comments by others! What a great location for a large workshop full of happy quilters! I am tickled by innovative names for groups, as well as plays on words and discovering how the Racing Fingers quilt guild came up with their name, putting 2 + 2 together left me with a giggle. For race car fans, it’s not hard to figure out. For those who don’t follow racing –it finally dawned on me that it all has to DO with racing, and that’s what comes to mind when most hear the words Daytona 500. These gals have adopted the popular theme and even their name tags have checkered fabric representing the popular checkered flag. So fun. We gathered together with 39 in attendance – two were missing, one calling in sick from home, and the other in hospital – so sorry to have missed the opportunity to spend the day with these ladies. the were missed and from what I understand text messages and photos were being sent back and forth to both in an effort to make them feel part of our day. I love the caring that happens with quilting groups! Talkin’ Turkey from String Fling was up on deck! All in good sport, girls! Much laugher, much chatter, much making of friends. Thanks, ladies! It was great meeting you! Class was followed by a quick dinner at Outback, and we were RIGHT BACK to the church for the evening’s guild presentation. Yes, Leslie, this was for YOU!! I love doing impromptu shout-outs. The atmosphere is always so fun and so full of friendship and connectivity, I am happy to be part of it! Leslie, you were missed, and I hope to see you NEXT TIME! It was a double long day. By the time we packed it all up and got back to Terri’s house I was ready for bed. I finished editing the YouTube video and it was off to dream land for me. If you are noticing that this is posting just after 6am, it’s because I am off to Mount Dora early this morning – We are headed out at 7:15 so I can be there by 9am and do it all over again. This time a morning presentation followed by a half-day Chunky Churndash workshop with a repeat of Talkin’ Turkey tomorrow. These Florida gals are not letting any moss grow beneath my feet! Bring it on! This is something I have been thinking a lot about lately. Sometimes you have to pull yourself away from the noise and even the happy fun chaos and listen to what your heart is really telling you. Your heart already knows the answer, even if your head doesn’t want to hear it! Quipped by Bonnie K. Hunter at 6:29 AM 15 Snips & Comments by others! It’s raining! It’s Pouring, the Quilters are snoring……. Go ahead, make up some lyrics – it’s been pouring buckets in Daytona all night long! It was one of those early airport run, yesterday morning. 4am alarm going off, run run run to get to the airport, haul the luggage to the counter. “I’m headed to Florida!” I say, a smile on my face – busy bag in one hand and my backpack in the other. It can rain. Of course it can rain – but there will be moments of sunshine between the moments of rain, and we’ll grab what sunshine we can along the way. Life lesson in there? My first stop on this 3-guild-tour? Daytona! 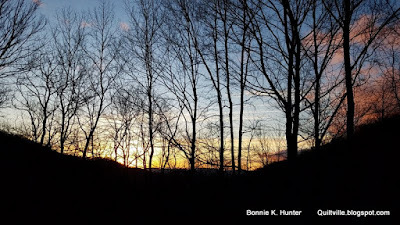 Quipped by Bonnie K. Hunter at 7:25 AM 12 Snips & Comments by others! Did you catch Quilt-Cam yesterday afternoon? We had so much fun, and the hour flew by so quickly! I loved it and can hardly wait until I can return home and get going on this project some more. There were many shares happening during our time together. This photo is by Jane Peck, and you can see me there on her tablet as she is arranging and rearranging her On Ringo Lake units and getting the blocks ready to assemble. Looking SUPER, Jane! So glad you could tune in. As for me….it was a continuation of these string block units being sewn into BIG blocks, and I thought that would be a great time for me to show some more on webbing the block. While I was doing MY thing – these things were coming in left and right (So many emails I couldn’t answer them all) and I saved these photos to share with you because the projects are just wonderful. I just love her fabric and color choices. Just when I think I have pieced too many projects with gray, I think…..let’s start another! It’s just beautiful! Ellen’s CHRISTMAS on Ringo Lake! “Hi Bonnie - just wanted to take this opportunity to show you my interpretation of this year's Mystery Quilt. I've had a goal off making charms quilts to user on all the beds in our home and I just need two more! This years' mystery helped me out! I just loved making it and want to thank you for all the time you put into these mysteries. They are each so different and fun to make! All of these On Ringo Lake finishes have been just WONDERFUL. SO fun seeing them all come together. Remember that we have ONE MORE MYSTERY LINK UP Coming up and I can’t wait to see ALL of the tops and quilts that have been finished, and any progress on quilts in progress as well. I was originally planning to run it on Feb 1st –but let’s push it to MONDAY, February 5th, okay? I’m teaching on the 1st and I’d like it to stay on a Monday. I’ll be back from Florida then, and things will just be a bit better. I will post a reminder on the 1st for those folks that miss this update telling them what is what. “Hi Bonnie! I’m in York, PA, adding some FMQ on my domestic machine to this quilt. It was a guild challenge for a scrap basket quilt, and thanks to your Scrap Users System, I had most of the pieces already cut and ready to go. The string pieced border was inspired by you as well. Thanks for all your generous patterns and tutorials over the years. Spectacular, Sarah! I love looking at each basket and seeing just what you’ve put in it. This is right up there with the string project I was working on as well! Christa’s String quilt in progress! What a great collection of scraps, Christa! The white string down the center of each block looks great! And this is a great lead in to what I’m working on! This Quilt-Cam includes an in-depth explanation and demonstration of "Webbing the Block." Click the arrow on the screen to start the feed. This is the Paca Pressing Mat I was talking about during our Quilt-Cam time. I LOVE this mat! 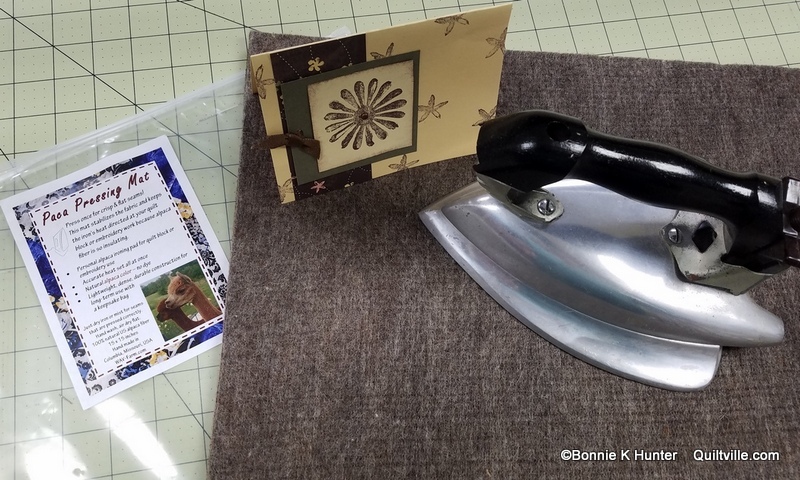 The 15'' x 15'' alpaca ironing pad stabilizes fabric for sharp, crisp seams when you press because it sets the heat from bottom and top all at once! The mat is 100% natural alpaca color (grays and brown tones) with NO dyes. You will find alpaca insulates better than wool. This is for use with a dry iron and water mist or starch. Since alpaca fiber naturally wicks away moisture and releases it into the air, the mat dries quickly between use. The fibers were washed in organic orange oil soap before professionally needle felted and steam pressed. Hand wash, gently push between layers of dry towel and then set onto a dry towel to air dry flat. Content 100% USA alpaca fiber, hand made in Columbia, Missouri for What AH View Farm. I have no affiliation, but I love how flat my string blocks are when pressing them on the Paca Pressing Mat. Idaho Square Dance from the Addicted to Scraps book! I grabbed this one off the top of the “pack for my lecture” pile. as I was packing yesterday. Making this quilt was far too much fun, strips and squares all came from my Scrap Users System! You’ll find the book at a discount in the Quiltville Store, and you’ll get a free Wanderlust PDF digital pattern sent to your email upon purchase! Books will be sent when I return home from Florida. Photo shared by Kevin H! This photo actually had hands and feet in it – good thing I was able to crop! Can you see that each star and the seams joining them are covered in embroidery stitches? AWESOME find, Kevin! And I believe this statement. Life is beautiful when we focus on it being so. I’m off to Daytona – catch you later from the land of sunshine, everyone! Quipped by Bonnie K. Hunter at 5:52 AM 9 Snips & Comments by others! It’s that drawing time you’ve been waiting for! And oh, the entries were hard and heavy down to the last minute before closing time! 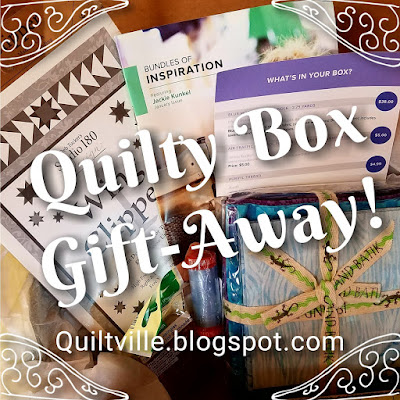 This is a Quilty Box that EVERYONE wants. It’s full of beautiful Island Batik fabrics, it’s got wonderful patterns and a great ruler for flying geese trimming – thread and inspiration. I’ve already cut into my own January Quilty Box fabrics, I just couldn’t resist – can you? Quipped by Bonnie K. Hunter at 8:49 PM 2 Snips & Comments by others! An upcoming publication interview arrived in my inbox yesterday. “Which sewing table?!?!?" “Does this mean cutting table?” “Or which machine table? !” Oh, just take a stab at it. And then it got to the part where they want a hi-res head shot for the issue and I thought….oh boy. I haven’t had a “GOOD” one done in a while. And the big regular camera is up at the cabin with the big long distance zoom lens on it for viewing wildlife. At any rate, Quilt-Cam is happening this afternoon (2pm Eastern! You made note of this, right?!) and if I spruce myself up perhaps I can get one of the men folk to take a photo in my “natural habitat" ? I am, for the very first time in a long long while, finding myself enamored with 7 projects all at once, and I am rather in a tithering dither. Or would that be a dithering tither?? Quipped by Bonnie K. Hunter at 9:53 AM 25 Snips & Comments by others! Birthday month is always fun. And you have been spoiling me rotten with everything from birthday cards stuffed with cut off triangle corners as confetti (Thank you, Auntie Em!) to delicious edibles (Jeff and I are STILL sharing that huge cheesecake, Prudence!) and more. The boxes were LINING the front hallway when I returned on Wednesday. There are still some envelopes I haven’t opened up, parceling them out to make this birthday last as long as possible. A very wise wise quilter told me that I should celebrate a day for each year of my life – 56 days of birthday celebration? I like it! Do you see this fun On Ringo Lake mug? Forest Jane, our fabulous logo designer for all of our mysteries designed this one especially for me! And you can have one too! Quipped by Bonnie K. Hunter at 9:32 AM 17 Snips & Comments by others! Did I catch you with this title? Was it the pie plate? The cast iron loaf pan? Or perhaps the whisk broom on the chair that did the dastardly deed? I honestly don’t know, but I love a mystery. And this one has had me captivated since I first “uncovered” this story while browsing the Antique Mall after the receiving of my “Birthday Bicuspid” just an hour previously. Quipped by Bonnie K. Hunter at 9:26 AM 34 Snips & Comments by others! What a great low-key birthday this was! For so many years I've been on the road teaching on my birthday, and while that was do-doubt fun, it was really nice to have a day to myself to work on projects, listen to audio books, watch the wildlife from outside of the cabin window, and just BE. I am currently re-listening to Diana Gabaldon's "Written in My Own Heart's Blood." I own each Outlander book in hard copy. I've read them all. But listening to Davina Porter as narrator just makes these stories come to life for me. 44 hours of listening time in one book? Perfect for stitching by! Quipped by Bonnie K. Hunter at 9:02 AM 42 Snips & Comments by others! It's a weird kind of birthday when photos don't upload to Blogger! This post will have a bit different formatting because I am doing it by email. Yep, back to how I got things to send while in China. Blogger isn't letting me upload photos to any post. WEIRD! Not from my computer, not from even a URL address. What's a girl to do? Find another way! 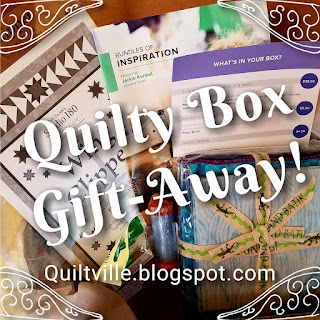 We can't have a Quilty-Box Gift-Away WITHOUT photos, now can we? So the photos have been uploaded by email and I am adding text between. Where there is a will there is a way. Quipped by Bonnie K. Hunter at 9:51 AM 59 Snips & Comments by others! In spite of everything else going on – for ONCE I remembered that tonight is our drawing for the winner of the March/April Quiltmaker bundle! I sitting here with a big cheesy grin on my face – new tooth included – because I think this gift-away has topped ALL of our previous records with more than 6,300 entries! This is a great bundle, and it will soon be winging its way toward……..will it be you? 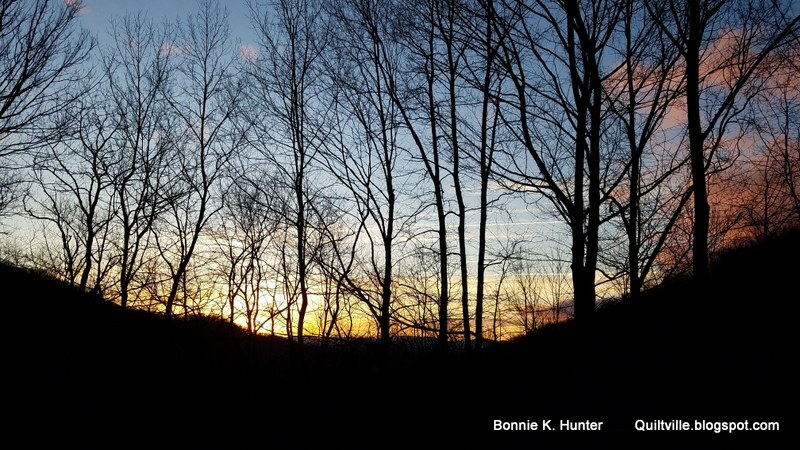 Quipped by Bonnie K. Hunter at 8:07 PM 26 Snips & Comments by others! There are some projects that nearly bring tears as you take the very last stitch. 15 years. Where did they go? It hits me even harder today I think with tomorrow’s birthday looming. What has this quilt seen happen in my life over the past 15 years? In 2003 we moved from Waxahachie, Texas to Irmo, South Carolina as the company that The Hubster Dave was working for expanded. South Carolina was SO exciting and I loved every minute of the 5 years we lived there. Quipped by Bonnie K. Hunter at 10:17 AM 42 Snips & Comments by others! My van Moby is back up to the top of the lane way next to the cabin, and temps will be into the mid 50s today. January in the south, you are a conundrum! Where it’s been in the teens and 20s for the past many weeks, this is a welcome respite, but I’m not up to trusting this trend yet. We’ve had many an ice storm in February as winter gives its last fight toward spring. No, I’m not trusting this at all! Notice the chain of pieces behind my foot pedal? Yes – I was busy in the loft! Quipped by Bonnie K. Hunter at 9:45 AM 14 Snips & Comments by others! All of my ducks were in their proverbial row by 1pm yesterday afternoon. Sadie and I headed out, waiting for the moment we saw mountains on the horizon. Can you see them? There. In the distance, just below where the sky turns blue. Tuesday and Wednesday’s snow was quickly melting – by the time I reached North Wilkesboro, NC hoping for a rendezvous with a certain vintage telephone chair (that I should have just purchased LAST VISIT!) the temps were already into the low 50’s f. SNOW BE GONE! I love the beauty of a lovely snow fall, but it’s the aftermath of crunchy ice encrusted rutted roads that I don’t like. Quipped by Bonnie K. Hunter at 10:17 AM 36 Snips & Comments by others! I’ve had something sneaky in the works for the past couple of weeks. And yes, since my extended add on trip to Arizona fell through, I WOULD be home! And then the planning began in earnest. I’m crashing a retreat! I’m really CRASHING a retreat! Hehehe! And then snowmageddon 2018 happened and I was snowed into my driveway – could I get out? I am so grateful to son Jeff who shoveled and shoveled that uphill driveway and got the van to the top by 4pm – I could drop mail at the post office (Since they couldn’t pick up from me, all about the driveway!) and head on over to Kernersville, about an 8 mile drive from the post office. It was slow going – roads in the rural areas are not plowed, and there was packed snow, ice ruts and all. Quipped by Bonnie K. Hunter at 10:18 AM 21 Snips & Comments by others! This morning’s view from the front porch of our little bungalow house in Wallburg. I haven’t seen snows like this since we left Idaho, and let me tell you – after 19 years of Southern Living, we don’t even OWN a snow shovel decent enough to get me out of here. And since we are Southern, we do ONE THING – we sit and wait for a thaw! And we have some fun as well. Quipped by Bonnie K. Hunter at 10:06 AM 24 Snips & Comments by others! I awoke this morning to SNOW! Not big heavy flakes, but fine crystals falling silently. How long had they been falling? I don’t know! Perhaps it started in the wee small hours of the morning. The wind didn’t blow, there was nothing at all to let me know that I would open the door this morning to a wonderland of white. A snow day! A home day! FABULOUS! 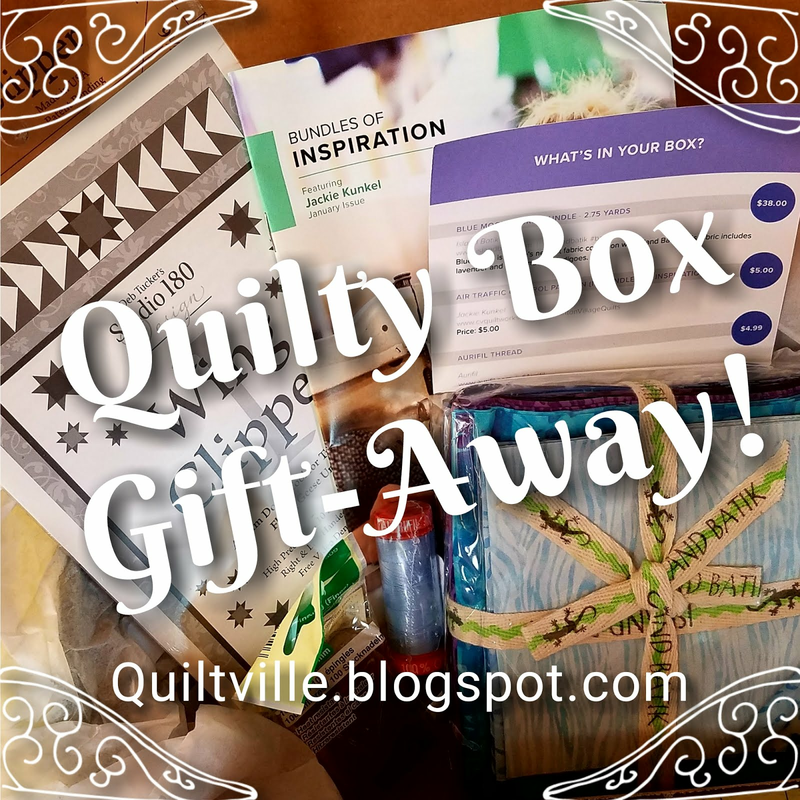 And since my Quiltmaker Magazine also arrived yesterday, I thought today would be a good day to celebrate my home day snow day sew day with a Quiltmaker Gift-Away. Quipped by Bonnie K. Hunter at 9:48 AM 37 Snips & Comments by others! Today I’m sharing the UNDERSIDE of the hand quilting progress on Jason’s hexie quilt! I am loving the texture of the hand quilting on this one. The hexies are small, only 3/4’’ per side so the quilting is fairly dense. And I think the tea dyed color solid was the best choice to show the texture. I’m not outlining each individual hexagon, but echoing each path, and any center hexie that stands by itself I am quilting with 3 crossing lines in a starburst. Progress on this monster has been fairly slow, just an hour or so in the evening while I am home, but any progress is PROGRESS. This quilt has been in progress since 1999 so what is the rush? Click the photos to view a larger image. I am loving the silk batting by Hobbs, and have settled in with size 10 betweens by Roxanne for my needle of choice. The 11s were just too short, The 10s bend a bit, but I can load just the right number of stitches on them per hexie side because of the length of the needle. Quipped by Bonnie K. Hunter at 9:07 AM 17 Snips & Comments by others!